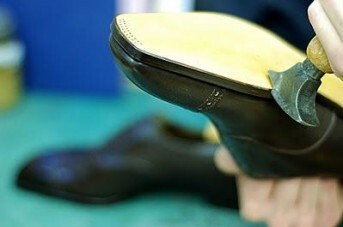 ‘Clicking’ is the name given to the process of cutting the leather sections of the shoe uppers. The name ‘clicking’ is derived from the noise that is made when the blade of the knife is removed from the leather when this is done by hand. The leather is carefully selected and the “clicker” will proceed to cut the shape of the upper, by hand, from the high quality hides. This is a skilled and specialist job because any flaws in the leather must be worked around, and as leather is very expensive any waste must also be kept to a minimum. Here the component pieces are sewn together by highly skilled machinists so as to produce the completed upper. The work is divided in stages. In early stages, the pieces are sewn together on the flat machine. In the later stages, when the upper is no longer flat and has become three-dimensional, the machine called post machine is used. The sewing surface of the machine is elevated on a post to enable the operative to sew the three dimensional upper. 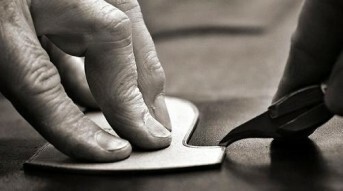 Various edge treatments are also done onto the leather for giving an attractive look to the finished upper. At this stage only, the eyelets are also inserted in order to accommodate the laces in the finished shoes. The completed uppers are moulded into a shape of foot with the help of a “Last”. The ‘last’ is traditionally a wooden mould shape that simulates the foot shape. It is later removed from the finished shoe to be used further in making other shoes. Next, an insole is attached to the bottom of the last. For welted shoes a rib is attached to the under edge of the insole. The upper is stretched and moulded over the last and attached to the insole rib, producing a “lasted shoe”. Now, the welt- a strip of leather or plastic- is sewn onto the upper and insole of the shoe through the rib as an attach-point for the sole. The space enclosed by the welt is then filled with cork or some other filler material (usually either porous or perforated, for breathability), and the outsole is both cemented and stitched to the welt. The upper and all the surplus material is trimmed off the seam. 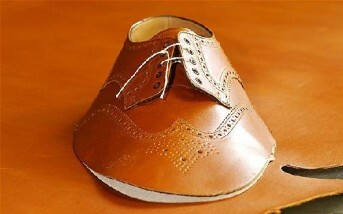 The heel is then attached which completes the “making” of the shoe. 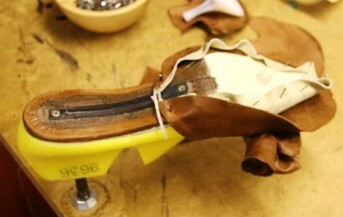 The finishing of a shoe depends on the material used for making it. If made of leather, the sole edge and heel are trimmed and buffed to give a smooth finish, often performed ‘freehand’ by a skilled worker. To give them an attractive finish and to ensure that the edge is waterproof, they are stained, polished and waxed. The bottom of the sole is often lightly buffed, stained and polished and different types of patterns are marked on the surface, called ‘bunking’, to give it a traditional craft finished look. Finally, an internal sock, usually a small piece of leather, is fitted into shoe containing the manufacturers details or a brand. A “finished shoe” has now been made.